Much is written about Benjamin F. Church, a Milwaukee pioneer carpenter and builder, whose small Greek Revival house built for his family in 1844 is today a pioneer museum open to visitors each summer. I have written for Wikipedia both a biographical sketch for Benjamin and an article on the Benjamin Church House that is listed on the National Register of Historic Places. I have also photographed the house. Here I briefly chronicle some of Benjamin’s public service and community leadership in the fledgling city, starting when Wisconsin was still a territory. Remember that Milwaukee was not incorporated as a city until 1846 and Wisconsin gained statehood in 1848. One of the first records of his civic involvement is seen in the Milwaukee Daily Sentinel and Gazette of 2 Nov 1839 that reported on a meeting of 2nd Ward Whigs at Washington House. “On motion of Benj. Church a committee of Vigilance and Finance for the Second Ward was appointed, consisting of J A Phelps, L N Dewey and Wm Sanderson,” the paper states. Other news article show he was active locally in the Whig Party, but later was a Republican. After incorporation, Benjamin was 1 of 15 men chosen for a 2nd Ward nominating committee to develop a slate for alderman, assessor, constable and street inspector, as reported the Milwaukee Sentinel on 22 March 1847. During the 1850s, Benjamin Church was elected to represent his ward on the Board of School Commissioners and to serve as assessor for his ward. He also was a fire warden and election inspector for his ward. Later in his career, Benjamin was one of 13 men to serve as sealer of weights and measures, as per the History of Milwaukee (Andreas, 1881). In other realms, Benjamin was one of 5 founders of Royal Arch Masons Chapter 1 in Milwaukee on 16 Feb 1844, as per Memoirs of Milwaukee County: from the earliest historical times. He filled several offices including, in 1844 & 1845, Junior Deacon; 1849-1853, Treasurer; 1853, Senior Warden; and then in 1860, Tyler. He was also a member of Milwaukee’s Old Settlers Club since he had arrived from New York before 1839. 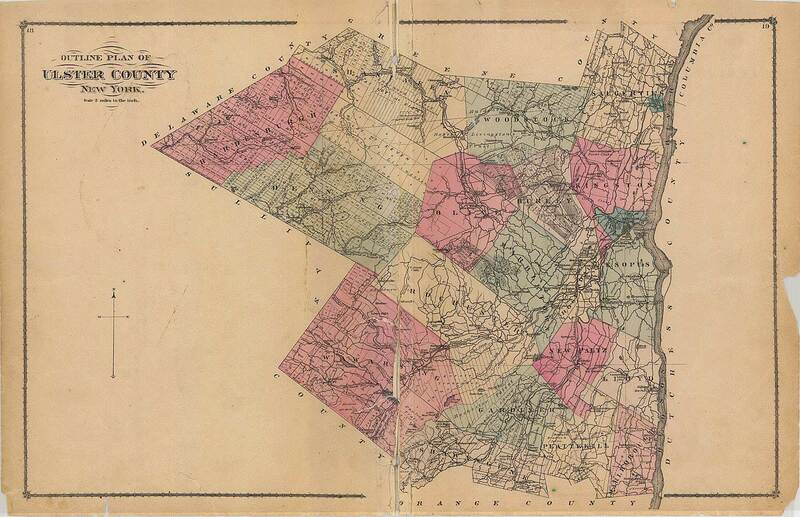 He was the son of Caleb Church and Hannah Baker Church of New Paltz, Ulster County, New York. 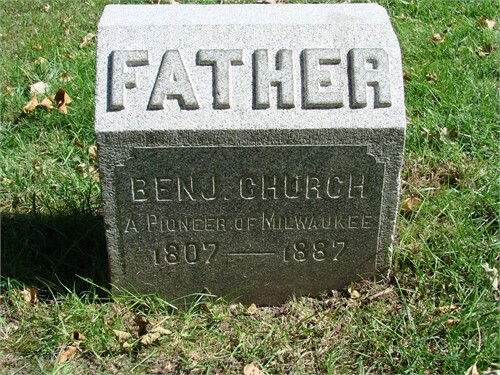 Benjamin F. Church was clearly a “builder of Milwaukee,” not only as a carpenter and contractor but also in helping establish governing structures and fraternal organizations for the city as it boomed in population from 5,605 in 1840 to 31,077 in 1850, soon after incorporation, to 138,537 in 1880, according to Populations of States & Counties of the U. S. (1790-1990), edited by Richard L. Forstall. It is little wonder that many of his descendants to this day having noted with pride that Benjamin was among their ancestors. Note: I am seeking the ancestry of Benjamin’s wife Permelia, full name perhaps Elizabeth Permelia. View the query here. Genealogy blogger Amy Johnson Crow has issued a challenge to all who blog about their family history: write about 52 of your ancestors in 52 weeks, or one per week. See her challenge here. A number of bloggers are taking up the challenge, and you can find their posts by searching the Internet with the phrase 52 ancestors 52 weeks. This is a great way to make sustantial progress on writing one’s family history, and can also be a way to connect with unknown cousins who do web searches on names of shared ancestors. I have started 2014 with a posting — actually a detailed query – about my 3rd great-grandmother who was the wife of Milwaukee pioneer Benjamin F. Church. She is called Permelia and Elizabeth in various Wisconsin records. A maiden name of Clemens is given in one record, but is not confirmed. I hope to continue this 52 Ancestors in 52 Weeks Challenge. Thank you, Amy!